SUPERIOR SECCO®. 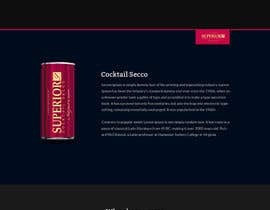 SUPERIOR SECCO® is a stylish, innovative, premium and high quality sparkling wine cocktail, in a convenient slim 200 ml can, and produced in Italy's Veneto region. 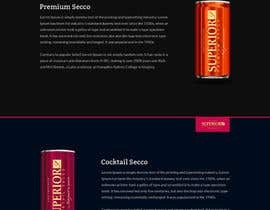 SUPERIOR SECCO® comes in 2 delicious varieties: PREMIUM and COCKTAIL. Claim: IS MORE THAN A DRINK, IT´S A PLEASURE. Target market: 20 - 45 year olds. Sub-line: Sparkling. Fresh. Ice cold. Tonality: Noble, premium, value, expensive, elegant, stylish, trendy, sophisticated, cosmopolitan, new, sassy, entertaining. 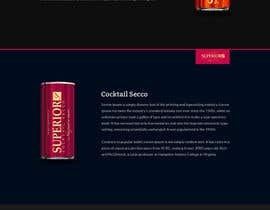 USP: ideal single-serve 'pick me up', Slim, convenient 200 ml can, direct consumption, No need for a glass, low weight compared to glass, Optimal handling, ideal for mixed drinks, i.e.,Energy drinks, Cocktails etc. Please check the attached files. We want it to be vibrant, modern, attractive and catchy. Please be creative and do not be shy. The website will be responsive and in HTML5. Hello there, is there anything to code with HTML? or just the mockup? Yes need to see a HTML page please!